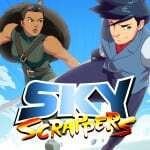 Ground Shatter and Ant Workshop have revealed that SkyScrappers, an arcade-style, multiplayer fighting game, will be available on Nintendo Switch later this month. The game throws players onto a variety of exploding skyscrapers, where they must race, scrap, and scale their way up crumbling brickwork to reach the top. Players must time their ascent to navigate treacherous debris and utilise falling platforms, all while simultaneously attacking their opponents to force them back down to the bottom. You can play with friends in a 2-4 player local multiplayer setup, and a single-player campaign is also on offer with a range of modes to master. The game originally released on PS4 and Steam back in 2015, with our chums over at Push Square finding that it left rather a lot to be desired in their review. Despite feeling that the game is "rather intuitive in the way that it controls", Push Square said that its £17.99 store listing was "ludicrously overpriced". Interestingly, the Switch version - which is available to pre-order right now - has appeared on the eShop for £7.99, perhaps making the game more worth it on Nintendo's machine. As mentioned above, the game can now be pre-ordered from the European, US, and Australian eShops, and will officially release on the 29th October. Will you be giving this one a second round on Switch? Tell us below. My brothers will love this! It does feels like a 90's arcade smash bros. That's not a bad thing. Intersting take on the fighting genre. I guess you need to be creative these days to get attention. I really need to get a Hori stand so I can enjoy Tate mode for games. AS original as Smash bros. This looks pretty crappy. Looks like old flash games I'd play almost 2 decades ago.... And I feel old.....again,lol. TATE mode doesn't seem to fit with this game ?!?!? Are there really only FOUR fighters or did I blink?